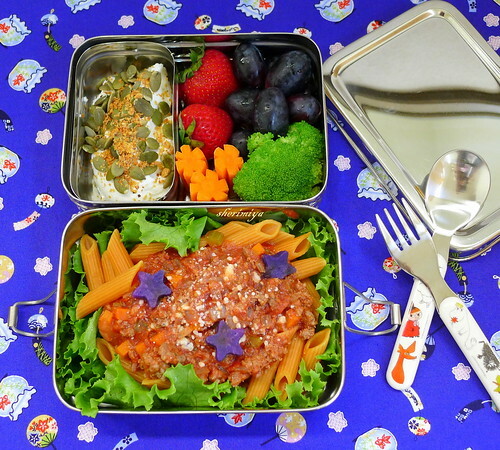 Penne Pasta Bolognese Bento, a photo by sherimiya ♥ on Flickr. Last time I made bolognese (here) I showed you TinySprite's bento. This time I'll show you MisterMan's version. It's the same, except he gets regular wheat pasta; this penne is made with tomato and carrot puree so it looks orange. I lay the pasta on a bed of lettuce, then spoon the sauce over, and top with parmesan and a few steamed Okinawan sweet potato cut into star shapes. In the upper tier of this cool EcoLunchBox he gets Greek yogurt with pumpkin seeds and wheat germ, and the usual fruit and veggies to the side (carrots, broccoli, strawberries and grapes). Just gorgeous! I don't know how you do it, the colors are fabulous. Everything looks so bright and fresh and delicious. I love it! Sheri, your bentos are wonderful. I've been following for about a year or so I think. Do you heat things (or cook them) in the morning and pack them warm? My kid doesn't seem to mind eating most food cold, but I'm never sure if I should heat food and trust it will be ok for 4 hours or so, or if I should prepare it ahead of time and send it cold out of the fridge, maybe even with a cold pack. Suggestions? I normally pack their bento at night, unless it's a thermal bento. Those I heat up in the morning, then pack hot. For all other bento I cool the food down before packing. In the morning I take out the bento and allow it to warm up to RT naturally. Most foods do well at room temp, and unless your kids don't like it, I think it's the best way to send bento to school. It's not safe to warm up the food and send it to school to cool down in the box. If it's a hot day, make sure to put an ice pack in the box. Try not to pack perishables, but if you do, like cheese or yogurt, use an ice pack as well. Hope this helps! Ooh! This is definitely one my kid will devour! Fruits and all.. She might even ask for seconds. : ) I love the stars on top.. so cute! 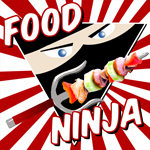 This is one bento my kid will devour! Fruits and all! I love the stars on top, so cute. She might even asked for seconds!